Beren Academy is not the first Jewish day school to find itself in a Shabbat-related predicament at the end of the season. 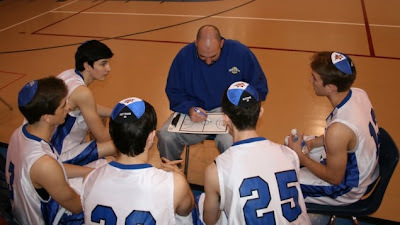 Many Jewish day schools are part of sports leagues with other private schools that are willing to accommodate the Jewish school's commitment to observing the Jewish Sabbath during the regular season and not scheduling competition during those 25 hours of rest. The problem often occurs during post-season tournament play when a lot of games need to be scheduled in a short period of time. On Thursday, the Texas Association of Private and Parochial Schools (TAPPS) backed down and agreed to allow Beren Academy's semifinal basketball game to be rescheduled rather than face a legal battle. Several of the Orthodox players and their parents filed suit Thursday morning against the Mansfield Independent School District, the host of the state championship, and TAPPS in U.S. District Court alleging a violation of religious freedoms. Instead of contesting the matter in court, TAPPS gave in and amended the schedule to accommodate the yeshiva. Earlier this week at the Rabbis Without Borders alumni retreat, several of us discussed the Beren Academy case. There are certainly two sides to the case. While I believe in religious tolerance and am always grateful when institutions seek to accommodate individuals observing their religion, I also believe that there are consequences that must be accepted when upholding ones religious beliefs. In the case of Beren Academy, the school was made aware that the yeshiva's games would not be rescheduled in tournament play if they fell during Shabbat. This was articulated by the tournament organizers to the school before Beren Academy agreed to register. Furthermore, the Shomer Shabbos (Sabbath observant) boys should understand that when you keep the laws of Shabbat there will be opportunities that will be missed. One would imagine this would be something that their parents and teachers would explain to them. Those of us who observe Shabbat can list the many sporting events, concerts, parties, graduations and other events we have missed as a result of adhering to the sanctity of Shabbat. I think that it is wonderful that TAPPS and the tournament host agreed to reschedule Beren Academy's game, but had they held their ground this should have been something the players accepted. There is a common phrase in Yiddish -- S'iz shver tzu zein a yid -- that means it's tough to be a Jew. We can't expect the secular world to always accommodate us when our religious values come into conflict with regularly scheduled events. It is true that this wasn't such a clear cut case in that there had been other accommodations for Seventh Day Adventists that amounted to precedent, but ultimately what makes being Shomer Shabbat so special is the knowledge that certain things are sacrificed to uphold the sacredness and sanctity of the Sabbath. One of the truly amazing aspects of being part of the Rabbis Without Borders fellowship (which is run by Clal, the National Jewish Center for Learning and Leadership) is the dialogue with colleagues from different denominations. I offered to include the viewpoints of my colleagues in this blog post and below are three opinions from members of my Rabbis Without Borders cohort. There is a Hasidic legend of a man who was offered a large sum of money by a king in exchange for a favor that would involve violating the Sabbath. The man declines but then presents the king with a gift thanking him for helping him realize that there was something in his life more valuable than the king's treasure. The students of the Beren Academy in Houston faced the unfortunate circumstance where their request to have a high school basketball tournament postponed to avoid playing on the sabbath was denied. While these boys may be extremely disappointed and might even think the decision was unfair, they have the privilege of joining many generations of earlier American Jews who made tremendous sacrifices to observe the Sabbath. In doing so, we can hope that like the man in the story, they recognize that they have something in their lives that they value more than winning basketball tournaments. Yet, at the same time, while the league was in the right having told the school before they joined that they would face this issue, the league should reconsider its schedule for future years. The religious observance of student players is one that should be honored and for the sake of competition -- the league and all schools involved should want to see the best team win. Would you change the date if it conflicted with Christmas? I think the obvious answer is, yes. The proof is that the tournament is not scheduled during church hours. The only arguments for not accommodating many different schedules and priorities is that the majority should dictate the results, and that if we accommodate shomer Shabbat Jews, then we will have to accommodate all scheduling needs. Unless you want a monolithic tournament that only includes the majority group and does not reflect the actual diversity of the community then the first argument fails on its face. And, yes I think we should accommodate many different needs - Jews, Muslims, Hindus, and many more. The basketball game is not more important than the creation of a large enough court to include all the players. I am less concerned with what decision was made but with how the children will understand and interpret what they are seeing happen around them. It seems to me that the children who are going to play are learning that exclusion is more important than accommodation and full competition. To me this goes counter to the religious and athletic values being promoted by playing in this league in the first place. The children who are staying home are learning that the religious values that they are learning in school are worth sacrificing for. The controversy seems to have been averted and Beren Academy will now be able to compete in the tournament. I wish them luck in their game and hope they emerge champions of the tournament. They won their case and managed to keep the Sabbath and keep their spot in the tournament. But I hope the lesson isn't lost on them. In life, we often have to give something up to really appreciate the value that we hold dear. Shabbat it is a special gift that we Jewish people have, but sometimes it comes with a cost. UPDATE: Beren Academy won their game today 58-46. Just to clarify- The students were accepting that they were not going to be able to play the game. In fact, in many of the local interviews on TV here in Texas, they stated that they were proud to be Shomer Shabbat and value that more than Basketball. The school had also accepted this and taken on this view. it was the parents who put on the lawsuit. Also, to be clear, the issue is more that TAPPS has a policy that does not allow games to be played on Sunday because of church and family values. It then would seem that the same reasoning should be employed to respect the Jewish Shabbat as well. It's good that there are 4 more days in the week in case the Moslems will object to playing on Friday which is their holy day. It was I, rachel Kapen who posted the previous one. In my local Conservative Kehilah here in Pittsburgh I sometimes see kids come to Shabbos service dressed in their little league outfits. They go to play their game when their time in junior congregation is over or they played their game earlier in the morning then cam to shul. is the Conservative mvovement really ok with this? Or should we just be thankful that anyone shows up dressed in any manner because the shul is so empty?